This is the story of a young African American hero, Lanier Phillips, who survived the sinking of his ship, the USS Truxtun, caused by a storm off the coast of Newfoundland. To help readers understand Lanier, Walsh begins his story with his childhood. He grew up in Georgia, in the 1930s, living under the constant threat of the Ku Klux Klan and Jim Crow laws. Watching the homes, schools, and barns of his black neighbors being burned to the ground, barred from enjoying the same privileges as white people, and always fearing for his life, bitterness and resentment grew inside Lanier. When the United States entered WWII, Lanier decided to join the Navy in the hope of escaping racism. Sadly, he discovered that life in the Navy wasn't any different than life back in Georgia. Black sailors were given separate sleeping quarters from the white sailors, and were required to eat their meals standing up in the pantry. Forbidden from eating in the same mess hall as the white sailors, Lanier was also required to serve them their meals and wash the dishes, do their laundry, and shine their shoes. Bitterness and resentment were eating him up. Then, on February 18, 1942, the USS Truxtun ran into a fierce winter storm, colliding with the jagged, steep cliffs off Newfoundland. As the ship began to sink, lifeboats full of white sailors tried to make it to land in the storm, but most of the boats didn't make it. Finally, it was the time for the black sailors to try to reach land, but the boats were gone and all they had were rafts. Lanier had to quickly decide to go or stay. Would black soldiers be welcomed by the residents, or would they do something else to them? In the end, Lanier climbed into a raft that capsized, throwing him in the sea. Lanier made it to the shore, and collapsed from exhaustion. When he woke up, Lanier discovered he was in Newfoundland, where he was taken in and nursed back to health by a local woman, Violet Pike. Many of the people who helped the sailors from the USS Truxtun had never seen a black man before, and they also didn't seem to have any of the prejudices he was so accustomed to. In fact, he was treated with respect and dignity by his rescuers. When it came time to leave their home, Lanier felt that because of the kindness he had experienced, he had lost the bitterness and resentment that had always been with him. 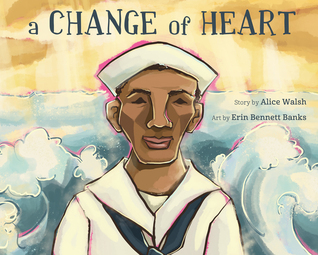 A Change of Heart almost sounds like it should be someone's idea of historical fiction depicting the transformation of an African American man when he finally treated him with love, respect, and compassion after living a life of discrimination and fear because of the color of his skin. And yet, it is a true story. Lanier Phillips always considered his experience with the Newfoundlanders the catalyst that changed his life. Lanier went on to have a successful career in the Navy as a sonar technician, and also became a Civil Rights pioneer with Martin Luther King, Jr.
A Change of Heart is a heartwarming, inspiring picture book for older readers that palpably depicts the racism and fear of Lanier's early life in contrast to the way he was treated in Newfoundland, and shows how one experience can really help a person to see things differently. Adding to this uplifting story are the oil painted illustrations done in Erin Bennett Banks' signature angular style. Be sure to read the About Lanier Phillips at the back of the book to learn more about this remarkable man. Immediately after the bombing of Pearl Harbor, 17 year-old Danny Graham joins the navy. But before he leaves for boot camp, he and his brother Colton, 12, are out fishing one day when a German U-boot suddenly surfaces, injuring Danny and putting him in a coma. Angry at the Germans for what happened to his brother, and feeling like there is nothing he can do, Colton decides to take Danny's enlistment papers and take his brother's place in the Navy. Tall for his age, Colton doesn't really look 17, but the country was desperate for fighting men and didn't look that closely at him, although different people do question his age. Colton, now called Danny, gets through boot camp, and even manages to impress his company commander with his knowledge of knot tying. Along the way, Colton makes two good friends, Josef Straub, legally in the Navy, and Woody, a 15 year old who also lied about his age in order to enlist. After graduating from boot camp, he is sent to Miami for subchaser training along with Straub and Woody. Subchasing was the job he requested in order to pay the Germans back for what they did to the real Danny. Sink or Swim is definitely not a character driven story. It is, however, a real action-packed novel that gives detailed realistic descriptions about everything Colton experiences in the Navy. And while this may sound like the exciting Navy adventures of a 12 year-old, there is enough truth in Colton's story to show the other side of war - death, destruction, fighting, and the fact that the Germans they run into are just young teenage boys, too. I did think that Watkins did a great job of maintaining a certain innocence in Colton. He is, really, just a seventh grader when he joins up. Feeling a tinge of guilt that his mom doesn't know where he is and what he's doing, he dutifully sends home his pay each month, sans $1.00 for himself. Compare that to his friend Woody, who spends it as quickly as he gets it. 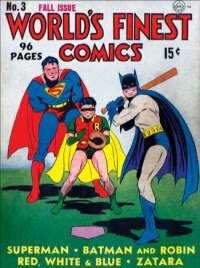 Although this isn't a character driven novel, I did like the cast of characters that Watkins put Colton in touch with. Sometimes they could be a bit nasty to him until he proved himself, but for the most part they were a pretty nice bunch of men. It was refreshing to read about men who didn't need to feed their manly egos in war for a change. And I think that helps make this a much more appealing story for middle grade readers. Watkins includes a nice glossary of Navy terms and of different events, like the Battle for the Atlantic, that might not be familiar to all readers. He clearly did a good deal of research for Colton's story, and has woven in lots of historically accurate facts that make this book so interesting to read. And readers may be surprised to learn in the Author's Note that Colton's story is based on the true-life story of a boy named Calvin Graham. Watkins includes a number of books and articles he read while writing Sink or Swim, including two about Calvin. One of them, "The Boy Who Became a World War II Veteran at 13 Years Old" can be read online. 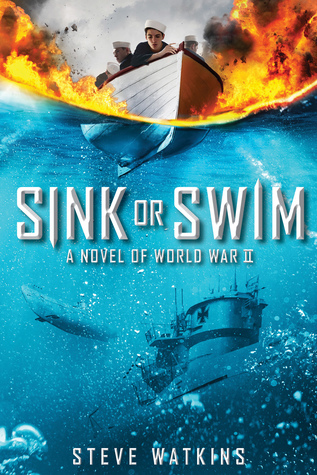 Sink or Swim is an exciting story that should appeal to WWII buffs, history buffs, and the fast pacing makes it particularly appealing for reluctant readers. This is the 7th Ranger in Time novel in this series, but I have to confess, it is the first one I've read. The overall premise is simple: Ranger is a golden retriever that has been trained as a search-and-rescue dog but has failed to pass the official test. It seems he keeps getting distracted by squirrels. Ranger lives with Luke and his sister Sadie. One day, while playing in the garden with Luke, Ranger finds a mysterious first aid kit complete with a strap that can go around his neck. Whenever the first aid kit begins to hum, Ranger knows that somewhere, someone is in trouble, and once he has the kit around his neck, Ranger will be transported through time to help whoever needs him. This time Ranger is transported to Normandy Beach just as the D-Day invasion is beginning. Walt Burrell, an African American soldier in the 320th Barrage Balloon Battalion, is also at Normandy Beach, packed tightly in a landing craft waiting to storm the beach. As part of the 320th, Walt's job is to hoist up the giant barrage balloons once the beach has been secured so that enemy planes can't fly over and bomb the American soldiers. Meanwhile, Leo Rubinstein is living on a farm just beyond Normandy Beach. Leo is going by the name Henri Blanc to hide his Jewish identity from the Nazis. On the morning of the invasion, the Blanc family prepares to take shelter from the constant barrage of bombs and gunfire. But Leo gets caught in a bomb hit in the house while looking for his sister's cat. Ranger finds himself on Normandy Beach next to Walt, who figures they brought a dog along to sniff out landmines. At first, Ranger doesn't know why he was sent to this chaotic place, but when Walt realizes his friend Jackson didn't make it to the beach, man and dog race back to the water to rescue Jackson and, thanks to Ranger, two other men. But even after all that, Ranger knows his work isn't done. Dodging gunfire and avoiding Nazis soldiers, Ranger makes his way to the Blanc farm, where he finds Leo, who is unhurt but knocked out. But when his sister's cat runs away towards the beach, Leo follows and there is nothing Ranger can do to stop him. Back on the beach, it is still absolute mayhem, with gunfire, shelling, and bombs going off, and then there are the landmines all over the area. But Ranger isn't trained to sniff out landmines. Can Ranger, Walt, and Leo survive the allied invasion? I've always enjoyed Kate Messner's other books and I really enjoyed reading this one. I found the writing to be clear, with straightforward descriptions, realistic characters and lots of excitement. I think Messner has captured the feeling of finding oneself in the midst of a very scary, very chaotic situation, whether man, boy, or dog. 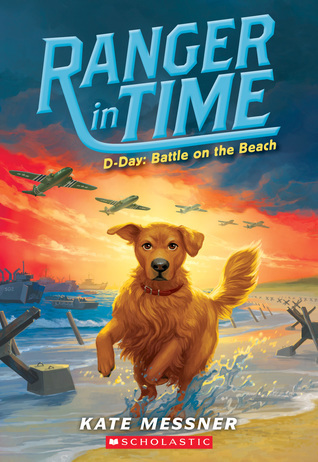 Ranger in Time is the ideal chapter book for all readers, but the excitement of a time traveling dog and the places he finds himself in may entice even the most reluctant readers. To her credit, Messner makes sure Ranger is always a dog - he doesn't think in words, but goes by his instincts and what he recognizes from his training, making it an even more interesting story. Sometimes, even Ranger doesn't know why he is somewhere, until trouble presents itself. There is lots of historical fact woven into this D-Day story, and Messner has included a list of sources she used, as well as a list of books for further reading. And while Walt is a fictional character, he is based on a real life hero of the 320th Barrage Balloon Battalion named William Dabney. You can find out all about him and all the other the research Kate Messner did for D-Day: Battle on the Beach in the back matter or you can read it online HERE. This history of the Holocaust is such a complicated, often confusing history that teaching it can be difficult - especially to upper elementary/middle school students. Most students have read novels that take place during World War II and the Holocaust, and while they certainly help to explain things, teaching the facts can still be difficult. How do you reckon the intentional destruction of 11 million people, including the attempted extermination of the entire Jewish race, 6 million of whom did indeed die at the hand of the Nazis, with the desire of one man bent on achieving his own ends of creating a master race. 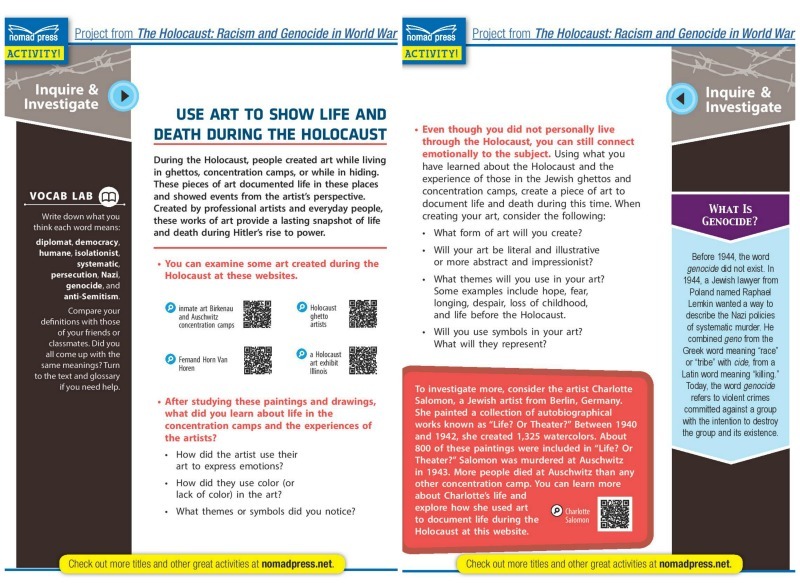 To help students and teachers understand the Holocaust better, Carla Mooney, who has written over 70 books for kids and teens covering science, social studies, and current events, has written a book to help readers learn about the Holocaust. In Chapter One, she begins with a brief, but detailed history of anti-Semitism, a history that began over 2000 years ago when the Romans exiled that Jews after defeating them and taking over their land in the Middle East, then brings the reader through the Enlightenment, the Great War and finally to the rise of Adolf Hitler and his Nazi party. 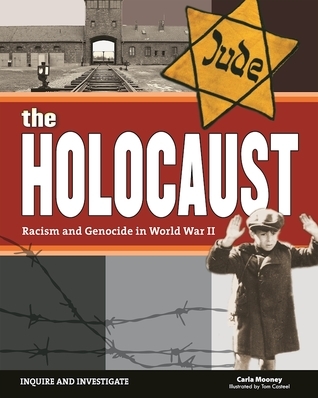 Chapter Two traces the rise of the Nazi party, the use of propaganda to sway the German people, the early treatment of Jews, the Nuremberg Laws, and finally the violence of Kristallnacht, including the destruction of Jewish businesses and homes, the arrest of Jewish men, and the killing of other Jews. Chapter Three details the occupation of different European countries by the Nazis, increased persecution of Jews, the different ghettos Jews were forced to live in until they were ultimately liquidated and the Jews sent "east" to concentration camps. Chapter Four looks at the Final Solution and the different, inhumane ways the Nazis used for eliminating Jews, including mobile killing squads, slave labor camps, and finally the creation of extermination camps, some capable of killing as many a 6,000 people a day. Chapter Five covers the end of the war, the liberation of concentration camps and the humanitarian crisis that followed, including the large number of displaced persons. Chapter Six asks the question how could the Holocaust happen? And there are lots of reasons for it, beginning with the fact that other countries simple did not want to offer refuge to Jewish refugees by increasing their limits on immigration, as well as countries that collaborated with the Nazis. Chapter Seven looks at the ways people found to resist the Nazis and save some Jews, including children, and Chapter Eight look at the legacy of the Holocaust. In addition to being interactive, you will also find sidebars that give more details, including Vocab Labs, Bear Witness sections, and key questions. There is also a detailed timeline, copious photographs and illustrations, a Glossary and a list of Sources. For students who can't used the QR code scans, there is a list at the back of the book of the websites used. If you are a teacher or a student, or just have an interest in finding out more about the Holocaust, I can't recommend this book highly enough. 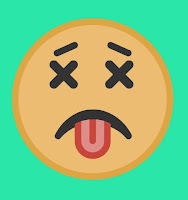 Before I begin getting back to the business at hand, let me just say I have been sick with flu for the last two weeks (yes, I had the flu shot). I never had the flu before and it was horrible, including two days I didn't think I was going to ever be OK again. If the flu does come calling, take care of yourself and, if you can, take the time needed to recover.